Rob Bickel is a Disney fan. He's done family vacations at the Magic Kingdom and watched plenty of the TV shows. That's why when his two daughters were young, Bickel knew the long-lasting Christmas gift he wanted to give them: Disney stock. Bickel bought the girls $1,000 each of Disney (DIS) stock in 2003 with the help of their godparents. Now that stake is worth nearly $5,000 for each girl. "We wanted to give them something they could keep forever," says Rob, 46, of South Bend, Ind. The Bickel family is among many happy Disney shareholders these days. Disney stock is trading at a record high after the company reported stellar earnings this week. It's up 36% in the past year -- more than double the gains of the U.S. stock market overall. Bickel and his daughters aren't selling yet. He's confident that Disney's wide footprint -- between amusement parks, movies and sports -- will help the company grow more. 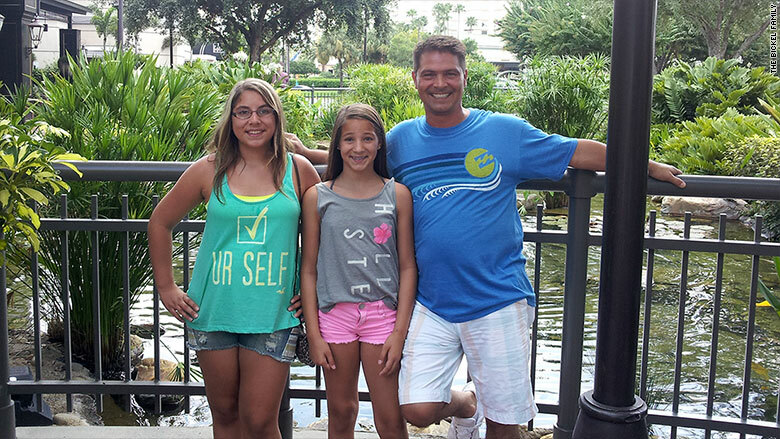 Rob Bickel and his daughters Brianna and Sierra. 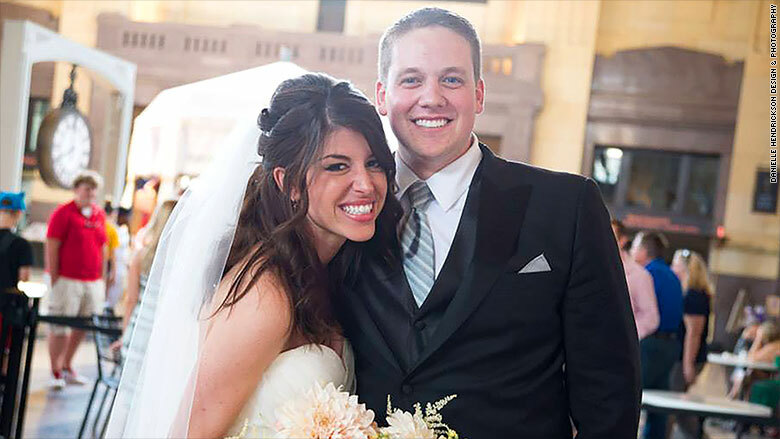 Disney newlyweds: Jake and Olivia Allen recently took the plunge on marriage... and investing. They're only in their 20s, but they wanted to invest some of their money beyond their 401k retirement plans. They sat down at home in Kansas City, Kansas earlier this year to discuss companies they liked. Disney was top of the list. They honeymooned at Disney World. Jake and Olivia Allen at their wedding. 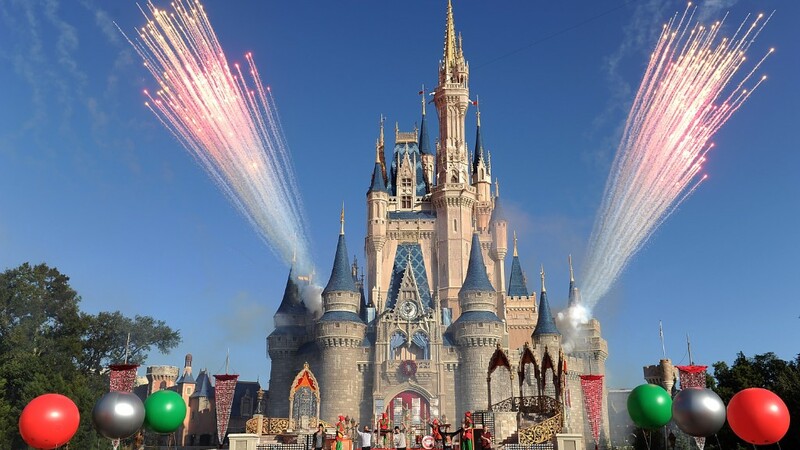 "I would definitely say that experience we had on our honeymoon turned out to be very influential on our decision to invest in Disney," says Jake, a logistics coordinator for a beverage company. But like other investors, Jake did his homework on the company too. He particularly likes Disney because it has so many sources of revenue between its different businesses. Jake and Olivia had been hesitant to invest until a month ago because so much of their paychecks went toward paying student loans or 401ks. When a friend recommended using Robinhood, a mobile app with no transaction fees, they decided to start investing. Investing has created new dinner table talk for the newlyweds. "She and I are both eager to learn," says Jake. "I've enjoyed expanding my knowledge on how individual stocks work." Gail Pesses, center, with her children Nancy and Danny. Buying Disney after vacation: Gail Pesses was uncertain about a Disney vacation with her 3-year-old son Danny decades ago. She had planned the trip, but then her dad died suddenly in 1986. 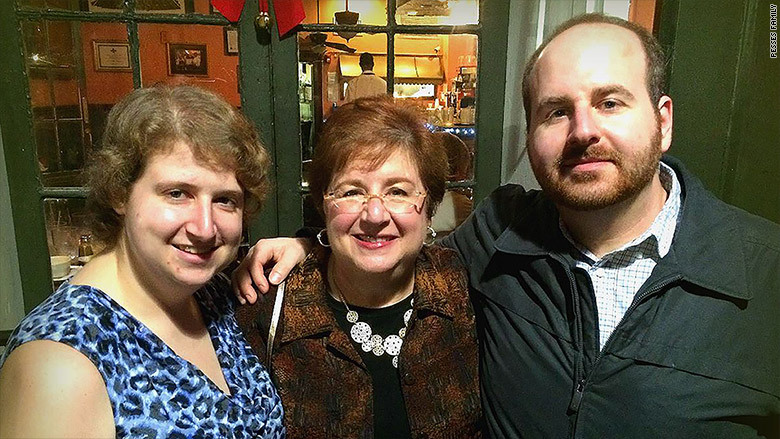 Gail's mother, Dorit -- a Holocaust survivor -- convinced Gail to go with Danny. Gail had never been to Disney before, but was always fond of it -- Disney had the first color TV show Gail saw as a kid. "It was this magical time when we escaped everything," says Gail, a therapist in Metairie, La. "We were converted Disney fans." Dorit, thrilled about her daughter and grandson's experience, soon bought two shares of Disney, which she eventually passed on to Gail. Talk about a great call. Disney's stock was worth about $3 then ($6.42 in today's dollars). When Dorit passed away in 2003, Gail's sister asked her if she wanted to sell the stock. Gail kept it. In early 2005, Gail took Danny and her daughter, Nancy, for another Disney vacation. In hindsight, it was a memory they've cherished even more because Hurricane Katrina hit the family hard six months later. Their house had to be gutted and they lived in a trailer while it was rebuilt. Having those good times at Disney helped cement Gail's desire to hold onto the stock. "It's a touchstone to those memories," says Gail. Gail, Danny and Nancy are talking about another Disney trip next summer.